I am one of your agency's adoptees; you may be familiar with my name. A few years ago, you and I interacted because I was cautiously considering the idea of reunion. I wanted to reunite but was afraid of hurting my adoptive family's feelings. I was also afraid that your agency would judge as being an "angry adoptee." I tried my best to communicate my feelings despite my fears. You were very kind in response, and I thank you for that. 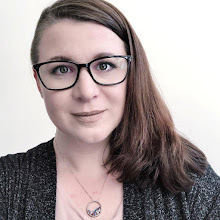 As I grow in my Social Work career, I cannot help but compare my Social Work knowledge, skills, and values to my own experience as a client of adoption. Adopted children are the most vulnerable individuals within an adoption system and therefore are an adoption worker's primary client. Helping professionals have the duty to secure the best interests of the child in adoption. According to multiple international conventions on human rights, a child's human rights include preservation of biological family whenever possible, preservation of heritage, and preservation of identifying family information. The NASW-PA itself has given written support for unrestricted adult adoptee access to Original Birth Certificates. Indeed, I am no longer a child. 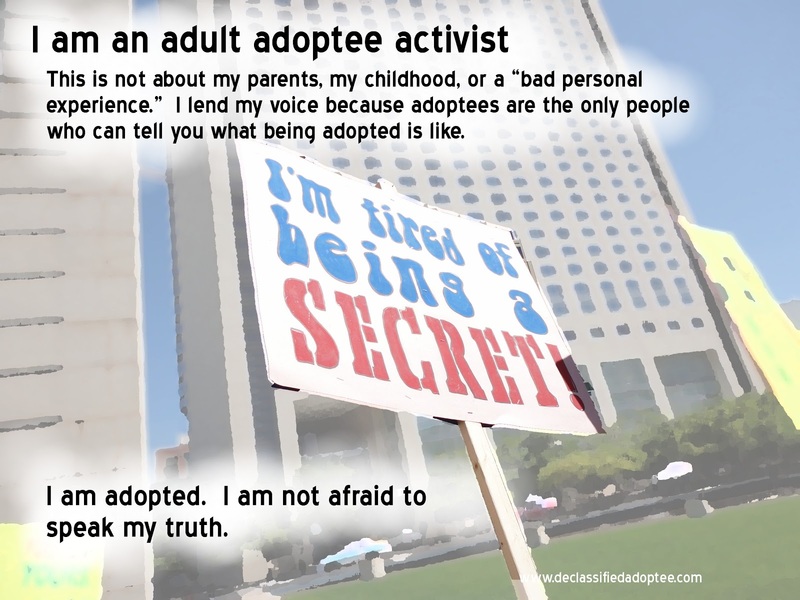 Yet despite being in the "child" role of the adoption system, I have never been treated by my adoption agency as a client of any sort. 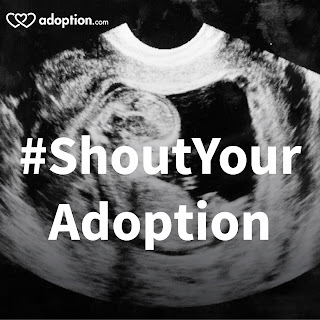 I received no post-adoption support (nor did my biological family or adoptive family) or on-going resources to help me make sense of my personal diversity in a non-adopted society. When I finally came back into contact with my agency some 20 years after my adoption, I once again was not regarded as a client. I have been effectively excluded from the client-practitioner system in my own adoption my entire life. When I say that my "client" role was not acknowledged, I refer specifically to the fact that ethical guidelines that are meant to protect clients--and the values behind them--were not extended to me. The NASW Code of Ethics clearly dictates that clients be given access to their records. They only exception is in extreme circumstances when information would cause significant harm to that client. A fee schedule for records access commodifies this right for clients based on class privilege. Non-Identifying records, more accurately described as "censored records," also do not honor a client's right to information. Yet this is what your agency offers to its adult adopted clients. 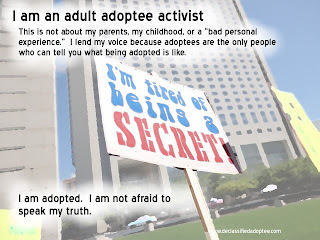 Adult adoptees returning to their adoption agencies for information value the same things Social Workers value. What we want is very basic and simple. We want self-determination and autonomy. We want a respectful and inclusive definition of family where our inclusively defined family is seen as a strength rather than a weakness. We want transparency and truth. We want to know that the policies we encounter are based on empirical evidence and best practices that are healthy for us and are respectful of our human rights. In summary, these very simple things honor our dignity and worth as people. 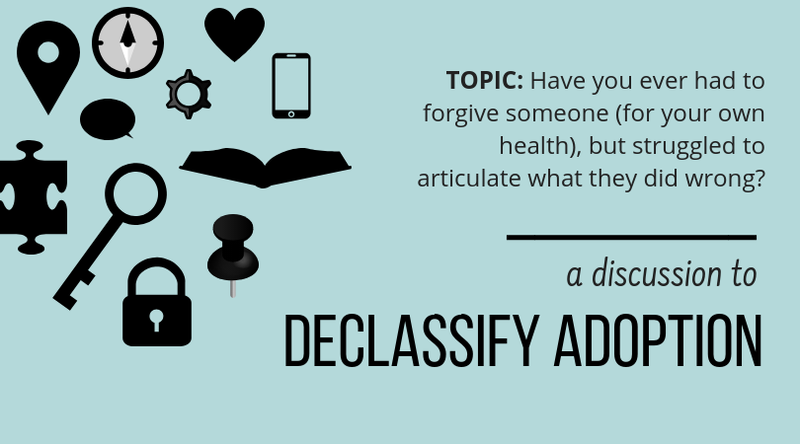 When you responded to me saying, "names were not exchanged at the time of your adoption" (which was a generalization and not my mother's actual wishes), and "I'll look in your file to see if there's anything in there that you can have," and later another Social Worker sent me an expensive fee schedule, I felt like I was an intruder into my own adoption system rather than what I actually am---a client, a consumer, a participant. I have never had any say within this system that has profoundly impacted my life--you can imagine how disempowering that feels. I do not blame you for not being able to give me my records. I understand that all of the helping professionals at the agency that my adoptive parents and I encountered during my quest for records access were just following agency policy. This is how adoption is for adoptees of my era. We are not considered clients. We are not even considered owners of our own birth experience. The fact that I once gazed into the eyes of the mother who birthed me means nothing. My cognitive stage of development at infancy that prevented me from recording her in permanent memory is held against me in the name of "confidentiality." What Social Workers can do is consider the inconsistency between agency post-adoption records access policies and the Code of Ethics / Core Social Work Values. We can work towards another one of our values, Social Justice, in places where it does not exist. In case you might like to know, I did reunite. I am in a wonderful on-going relationship with my first mother, 11 first aunts and uncles, and 26 first cousins and their children. I also have two brothers who have waited for me to return to the family their entire lives. It was you or another Social Worker who informed me that my first mother had contacted your agency when I was eighteen, but that you did not know why. So I asked my first mother. she was updating her information because she wanted to be contacted and she wanted me to have my records. She was also seeking reassurance that her information had already been released to my adoptive family because she had expected to be in contact with me long before my 18th birthday. In fact, her deciding factor in adoption had been that she was promised that I would know her and be able to contact her. She was convinced that openness, which didn't actually exist in 1985, would make adoption less painful for her. She spent nearly 25 years waiting for me around every corner and expecting my voice at the end of every phone call. She never gave up hope. What an amazingly strong woman she is.